This has been a HUGE week for Zymplify. After a few years of planning, months of building and weeks of testing (and re-testing) we launched Zymplify 3.0! The latest and greatest version of our software brings together a slicker and more intuitive UX, a My Metrics area to monitor your entire marketing function and it’s fully mobile optimised for you to check your stats on the go (as well as so much more). We are so excited to finally be able to show our clients our amazing new product. It’s the biggest release we have ever completed, and we hope all our clients love the new look and all the new and improved features. We listened to our clients and customer feedback, and completely overhauled the design of the platform. It had a much more contemporary look and follows the Zymplify methodology of identity, attract, engage, nurture, convert and measure. We have created a much more streamlined approach to your digital marketing and used our own Zymplify methodology as the structure. This is a tried-and-tested approach that we have been using for years, so we know it works. Not only will it help you generate leads at scale and turn them into paying customers as quickly as possible, but it will also always help your entire team stay focused and work towards the same goal. 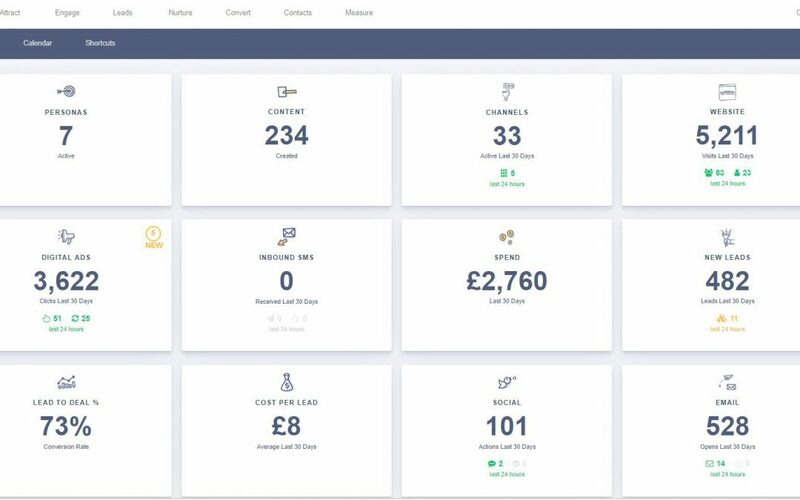 Zymplify’s platform allows you to manage and track all your marketing channels in one customisable dashboard. You can launch and measure everything including website marketing, email marketing, social media, mobile marketing, digital ads and much more. Using our sales pipeline you can replicate your sales process and customise it to meet your businesses’ needs. Track which stages your prospects and leads are in, within your sales process and identify which campaigns and channels are driving sales in one simple, easy-to-use pipeline. As you will already know, we launched our complete re-brand last year. The entire team worked together to get this just right, and we really love what we produced. With loads of market research, feedback from our clients, our leads and our own staff we finalised the design in May 2018. Launching in September, we’ve had loads of fantastic comments from our clients about how much they love the new look and feel of Zymplify. To celebrate our growth and expansion as a world-class digital marketing expert, we thought it was time for a change. We ditched the corporate look and introduced a brand that is much more reflective of our commitment to our clients, our passion for digital marketing and our fantastic company culture. We updated the website, logo, messaging, colours, imagery and introduced our new mascot – Zym. The new relaxed, but professional branding reflects our team of young and vibrant marketers, our company culture and core values. It also emphasises our commitment to our clients to help grow their business through expert digital marketing software and services. The new tagline, ‘Attract. Engage. Grow’, illustrates that Zymplify is here to support and understand our clients throughout their marketing journey, from start to finish. “It’s been a great year for Zymplify with our rebrand and redesign of our website,” Carly Warke, our Head of Marketing said. Don’t forget to sign up for your free trial to come into the platform and take a look around – we’d love to show you our hard work. We really hope you like what you see. Sign up for your 14-day, no obligation free trial here to see exactly what we’re talking about.